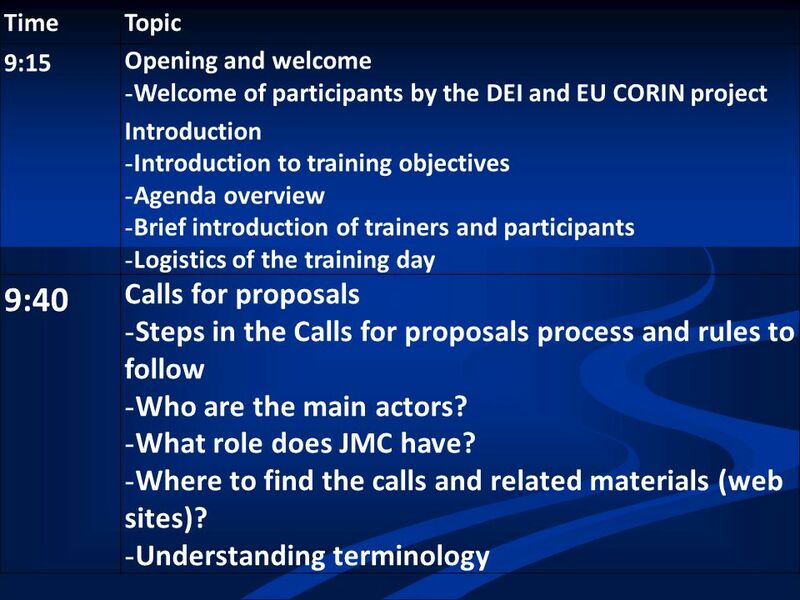 EU CORIN Supporting Cross-border Cooperation BiH – Croatia/Serbia/Montenegro Europeaid/122730/C/SER/BA ________________________ Topical Training for JMC. 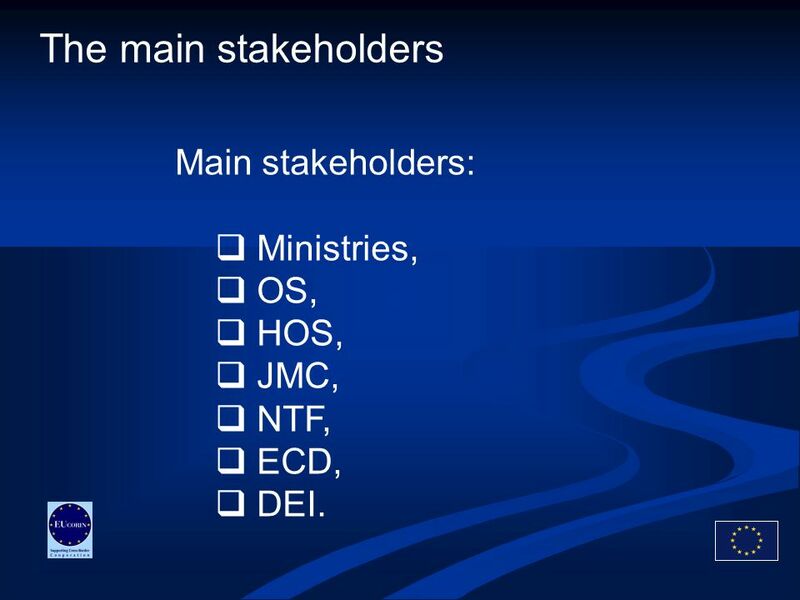 6 The main stakeholders Main stakeholders: Ministries, OS, HOS, JMC, NTF, ECD, DEI. 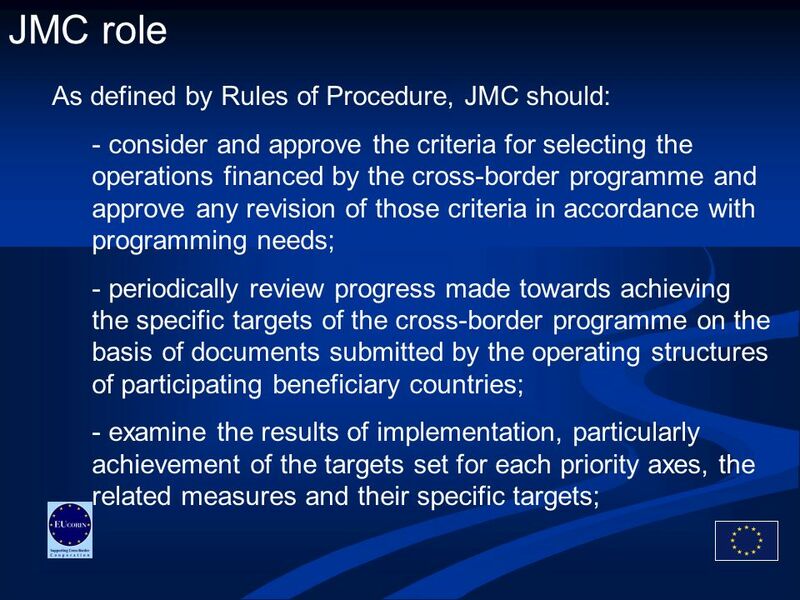 10 JMC role -consider and approve any proposal to amend the content of the cross-border programme; -be responsible for selecting operations, but may delegate this function to a steering committee. 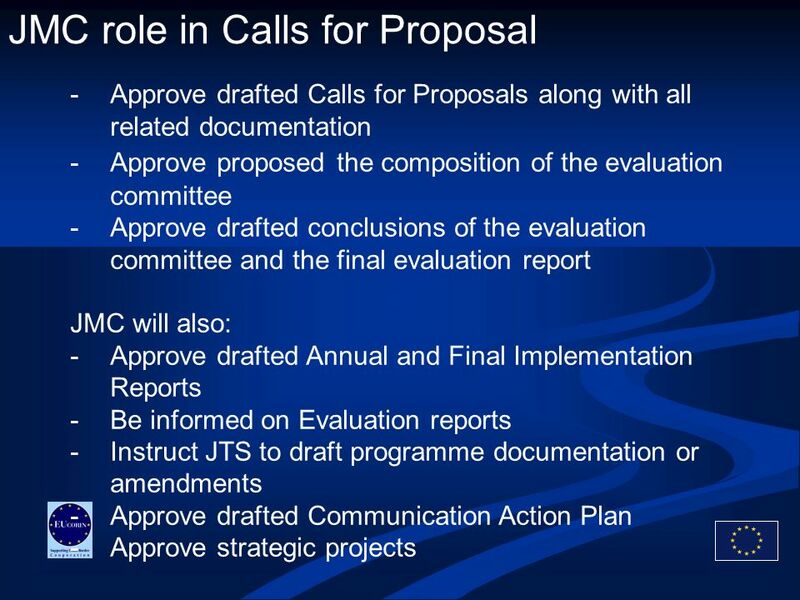 The composition of the steering committee may be endorsed, where relevant, by the Commission; -the JMC shall monitor the implementation of the proposals, made in accordance with the previous paragraph. 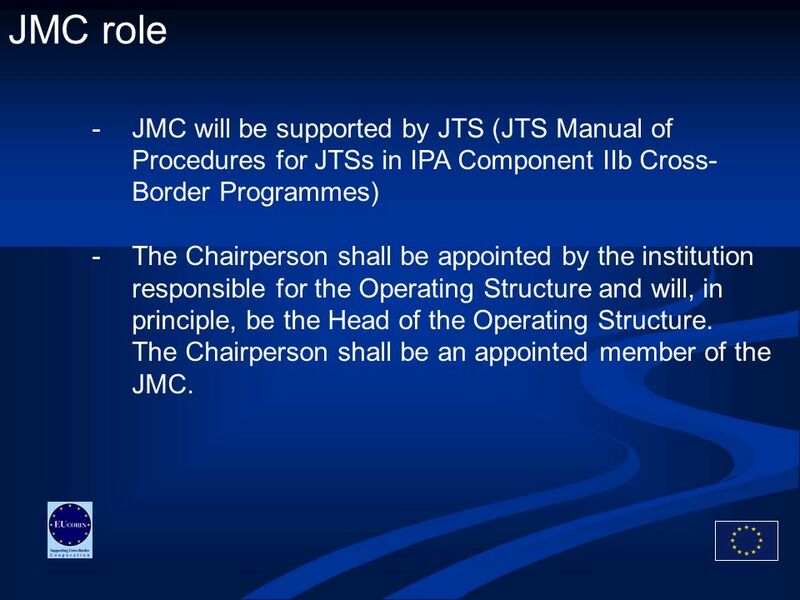 11 JMC role -JMC will be supported by JTS (JTS Manual of Procedures for JTSs in IPA Component IIb Cross- Border Programmes) -The Chairperson shall be appointed by the institution responsible for the Operating Structure and will, in principle, be the Head of the Operating Structure. 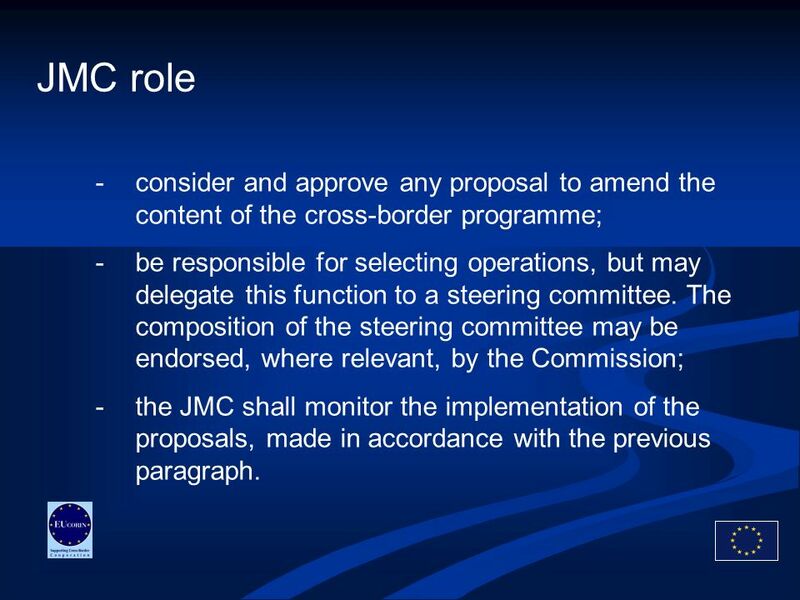 The Chairperson shall be an appointed member of the JMC. 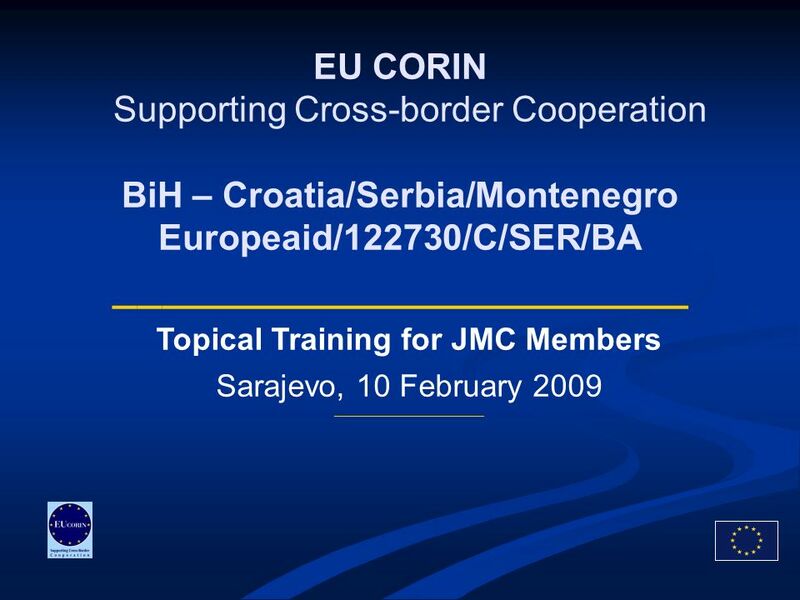 Download ppt "EU CORIN Supporting Cross-border Cooperation BiH – Croatia/Serbia/Montenegro Europeaid/122730/C/SER/BA ________________________ Topical Training for JMC." 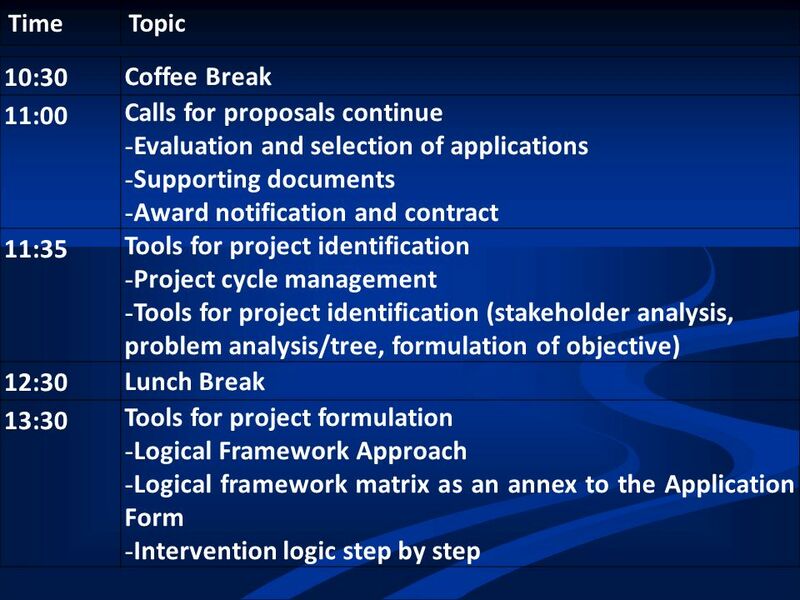 1 Programming period Strategy and Operational programmes DG REGIO – Unit B.3. Legal Basis for Management and Control Systems in INTERREG III programmes BSR INTERREG III B Joint Secretariat Matthias Heinicke Seminar on Financial Management. Regional Policy EUROPEAN COMMISSION 1 EGTC regulation EGTC regulation ESF and EGTC regulations Regulation of the European Parliament and of the Council. 1 Information meeting Communications Activities in the framework of the MEDA regional Information & Communication Programme targeting Youth in the Mediterranean. 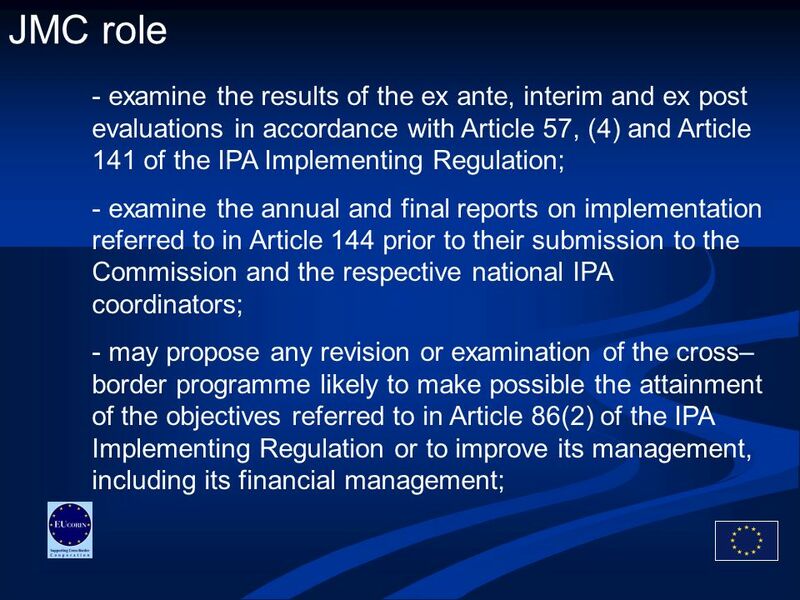 Fiche 5A Payment Application Fiche 5B Accounts 12th Meeting of the Expert Group on Delegated and Implementing Acts for the ESI Funds 28 June 2013. 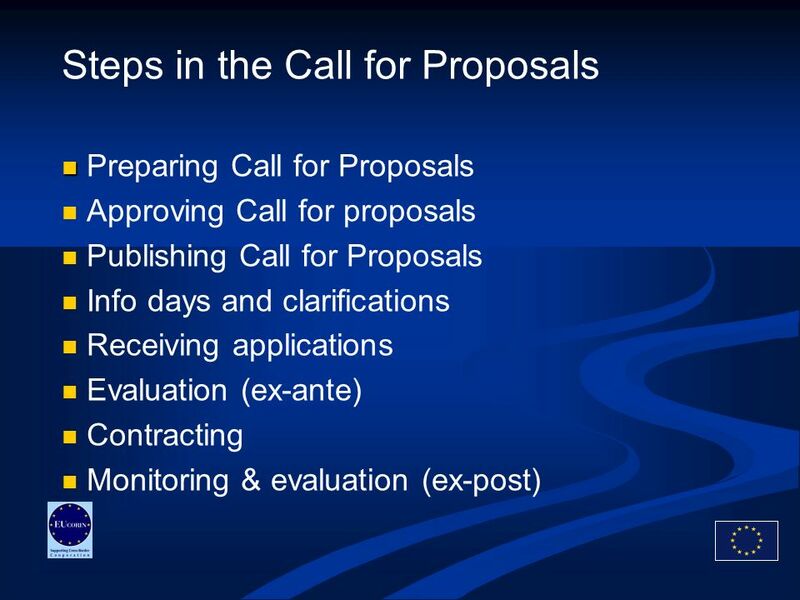 TEN-T Info Day for AP and MAP Calls 2012 EVALUATION PROCESS AND AWARD CRITERIA Anna Livieratou-Toll TEN-T Executive Agency Senior Policy & Programme Coordinator. 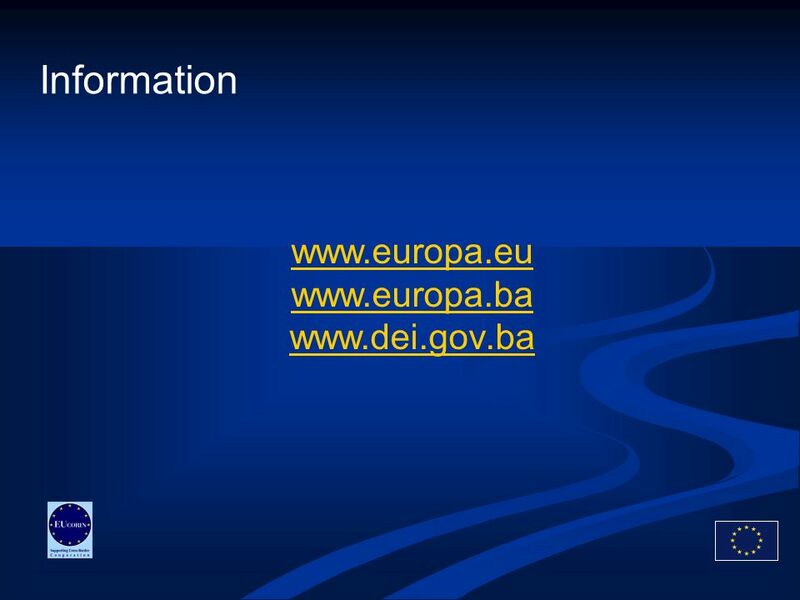 Joint presentation by respective units in DGs AGRI, EMPL and REGIO IPA Components III, IV and V: Conditions for successful preparation and absorption of. 1 Modification of Commission Implementing Regulation No 1828/2006 Lucie Žáčková DG REGIO, Unit D1Coordination Leif Hognas DG REGIO, Unit J1 Coordination. EuropeAid PARTICIPATORY SESSION 1: 3 topics Each table chooses its topic: o Managing reality (Blue) o Assessing performance (Yellow) o Monitoring & reporting. HUNGARY-SERBIA IPA CROSS-BORDER CO-OPERATION PROGRAMME NALAS Marketplace Istanbul, 10/12/2009. 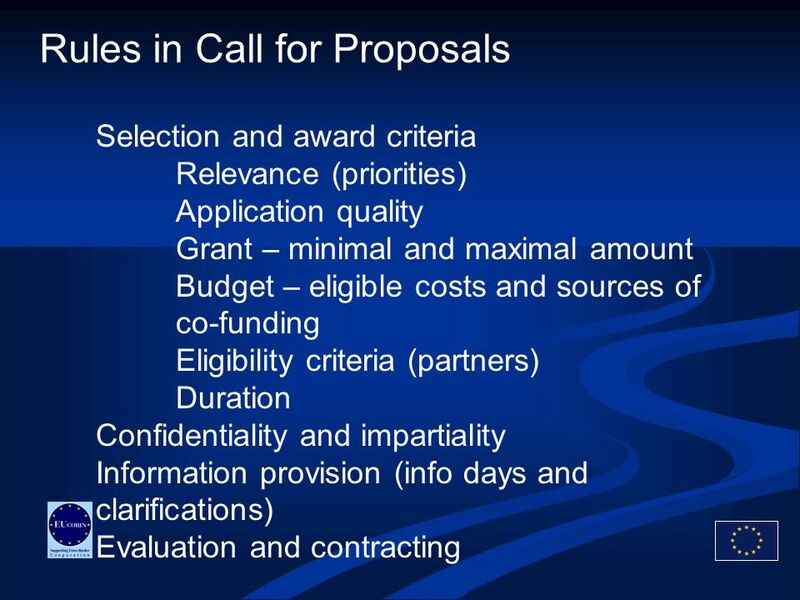 Launch of the ESPON 2013 Programme Procedures for Call for Expression of Interest under Priorities 2. Project design, preparation and approval Basel Convention Resource Mobilization Workshop Nairobi, 3 – 7 December 2006 Andreas Arlt Secretariat of the Basel. 1 SAICM & the QSP Established by the International Conference on Chemicals Management (ICCM), which adopted the Strategic Approach to International Chemicals. 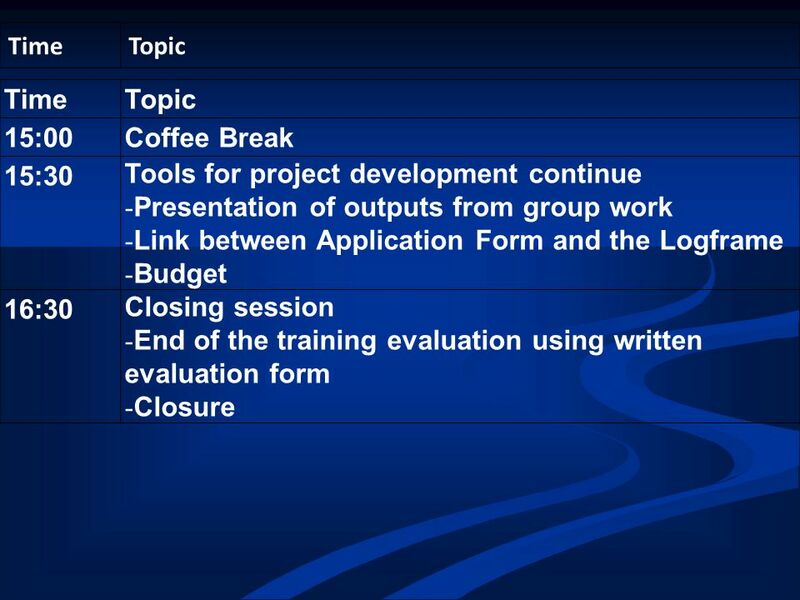 Croatia: Result orientation within the process of preparation of programming documents V4+ Croatia and Slovenia Expert Level Conference Budapest, 16-17.